This is without a doubt one of the best, if not, the best cards in the Tarot! 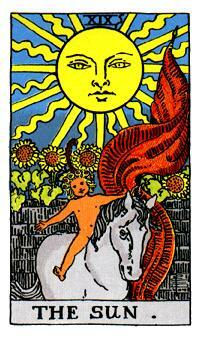 The Sun Tarot Card is a most welcome card in any reading. It is a signal of very happy times and joy. This tarot card can represent excellent holidays, very good news that commonly relates to children. Furthermore it can mean pending news about the conception or birth of a much wanted baby! The Sun Tarot Card delivers a message of a time of fun with family and friends. It also signifies agreeable companionship’s and relationships with those who will mean a lot to you. Ultimately, The Sun Tarot Card dispels all negativity and is a strong promise of a happy times ahead. Negatively however, The Sun Tarot Card sometimes suggests delays to plans your may have. It can also negatively impact on achievements and sometimes can warn against arrogance. This along with a blurred vision and misjudgment is simply caused by an inflated ego. Keep that in mind!